Analysis of neonatal mortality:is standardizing for relative birth weight biased? Infant mortality has traditionally been analyzed as a function of birth weight and birth weight-specific mortality. Often, however, when comparing two populations, the population with higher overall mortality has lower mortality at low birth weights and a reversed pattern at higher birth weights. Methods standardizing birth weight, such as the "relative birth weight", have been proposed to eliminate these crossover effects, but such methods do not account for the separate contributions to birth weight of gestational age and fetal "growth." Using data for singleton U.S. Blacks (n = 3,683,572) and Whites (n = 18,409,287), we compared neonatal mortality, gestational age, and the difference between the observed birth weight and the optimal birth weight (the weight at which neonatal mortality was lowest) among Black and White infants at the same relative birth weight. At relative birth weights below zero, gestational ages were, on average, 2.4 ± 1.5 (mean ± standard deviation) weeks shorter for Blacks than for Whites for the same relative birth weight. At relative birth weights above zero, no differences were observed in gestational age, but the optimal birth weight occurred at a much higher relative birth weight in Whites than in Blacks (4150 vs. 3550 g). Our results suggest that comparisons of neonatal mortality between groups using "relative" birth weight may be potentially biased by differences in gestational age at low birth weights, and by the distance from the optimal birth weight at higher birth weights. Infant mortality has often been analyzed according to two components, the birth weight distribution and birth weight-specific mortality; these are believed to reflect maternal health and perinatal health care services, respectively [1–3]. For example, Canada  and most other developed countries  have witnessed a dramatic reduction in infant mortality over the last quarter century. This reduction has been almost entirely due to decreases in birth weight-specific mortality, largely attributable to improvements in access to, and quality of, obstetric and neonatal care. This reduction in mortality has occurred in spite of the absence of a decrease (and more recently, an increase) in the rate of low birth weight (LBW, <2500 g) [1–4, 6–8]. Despite the utility of this compartmentalization, comparisons of birth weight-specific mortality (e.g., between racial groups or between smokers and nonsmokers) often reveal an interesting "paradox": mortality rates among LBW infants born to Black mothers (or to smokers) are lower than those born to White mothers (or nonsmokers). To resolve this paradox, some investigators have developed statistically sophisticated models based on "relative birth weight," i.e., birth weight relative to the mean birth weight of the relevant population (e.g., Blacks or smokers) [9–14]. The key inference from these approaches is that mortality for an individual is not related to absolute birth weight but to birth weight relative to the mean birth weight of the relevant population or subgroup. It is well known that the optimal birth weight (the weight at which mortality is lowest) in a population is above the mean birth weight  and that the distance between the optimal birth weight and the mean birth weight is larger in populations with higher mean birth weight [16, 17], yet the reasons for, and consequences of, these differences remain unexplored. Also unexplored is how and whether these difference are associated with relative birth weight. Emphasis has been placed on birth weight as a predictor of outcome and as a target for intervention to improve fetal and infant mortality, because it includes information on both maturity (gestational age) and fetal "growth" (birth weight for gestational age). Unfortunately, however, such an emphasis creates the illusion that determinants of fetal growth have large effects on mortality . Arnold et al  noted the innate confounding of gestational age and fetal growth when a cohort of small, immature infants is selected according to birth weight criteria (e.g. <1500 g). In such a cohort, the most mature infants are also the most growth-restricted, so if a risk factor (such as maternal smoking) affects fetal growth but not gestational duration, infants with this risk factor will be more mature at lower birth weights than those infants at the same birth weight who are not exposed to the risk factor. A comparison of mortality in these infants will thus exhibit the crossover "paradox". 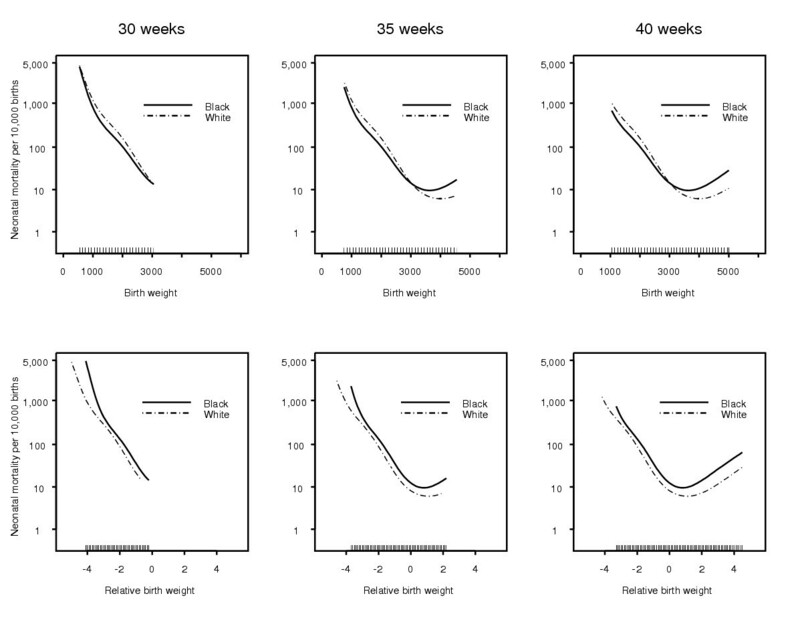 The relative birth weight approach resolves this paradox to some degree but masks the relative effects of the risk factor on growth and gestational age, and therefore may create its own analytic problems. We examine the association between neonatal mortality, race, and birth weight, considering relative birth weight, gestational age, and optimal birth weight. We show that the association between neonatal mortality and race-specific relative birth weight is severely confounded by gestational age and associated with distance from the race-specific optimal birth weight. We discuss potential explanations and alternative analytic approaches for this confounding effect. The national linked birth/infant death data sets for the United States for the years 1989–1991 and 1995–1997 were used for this study . Data for 1992–94 were unlinked and thus not suitable for this analysis. These data were assembled by the National Center for Health Statistics (NCHS) of the Centers for Disease Control and Prevention, with cooperation from the individual states and the District of Columbia. Gestational age assignment is predominantly based on the date of the last menstrual period (LMP). In about 5% of births, a clinical estimate of gestation, also contained in the vital statistics database, is used owing to missing LMP dates . In addition, the LMP-based estimate of gestation is replaced by the clinical estimate when the reported birth weight is grossly inconsistent with gestational age (based on LMP) . When the month of LMP is known but the day is unknown, the day is imputed as the 15th of the month . These modifications to the gestational age data are performed by the NCHS prior to release of the data files. We restricted our analysis to singleton live births and further excluded 75,074 infants with birth weight below 500 g, 381,483 who were delivered before 22 weeks gestation, and 175,103 delivered after 41 weeks. Births before 22 weeks were excluded because differential registration based on survival status biases mortality statistics , while births after 41 weeks were excluded because of the high proportion of gestational age errors  in LMP-based vital registry data. We also excluded an additional 104,755 pregnancies with implausible birthweight/gestational age combinations based on an algorithm proposed by Alexander et al . Finally, births to non-Black or non-White women (n = 1,113,132) were also excluded, leaving 22,092,859 singleton live births for analysis. Births to Hispanic mothers were included in the appropriate group. Neonatal mortality was defined as deaths to live born infants within the first 28 days, and is expressed per 1000 live births. Throughout the manuscript, "Blacks" and "Whites" refer to infants of Black and White mothers, respectively (i.e., race is defined as the mother's race). Basic summary statistics are used to describe the birth weight and gestational age distributions. We calculated the relative birth weight as a z-score relative to the mean birth weight in the relevant population, standardized based on the standard deviation of birth weight for that population. Race-specific neonatal mortality was modeled as a function of both crude birth weight and relative birth weight, using means and proportions. We also used a graphical approach to estimate the association between birth weight (crude and relative) and neonatal mortality. Using smoothing splines implemented in generalized additive models , we plotted the log-odds of neonatal mortality [log(d/s), where d refers to the number of deaths and s the number of survivors] against birth weight, relative birth weight, and gestational age. In order to test the statistical significance of the crossover effect, we used an interaction term between race and birth weight (or gestational age). In order to assess confounding of the relationship between birth weight and mortality by gestational age, we repeated the plots of mortality and birth weight and relative birth weight, stratified by gestational age. We plotted rugplots (each observation provides a tick along the X axis) to demonstrate the distribution of birth weight (or relative birth weight) at the selected gestational age. We estimated the optimal birth weight (the weight at which birth weight-specific mortality is lowest), by finding the lowest predicted mortality from the smoothing spline model and retrieving the associated birth weight (or gestational age) from a table of birth weight (or gestational age) and mortality. We compared the race-specific distributions of the difference between the observed and estimated optimal birth weights, and compared race-specific absolute differences between observed and optimal birth weights. We were unable to connect possible repeat births (i.e. siblings) to the same mother; however, the clustering that this induces is unlikely to have a major effect other than to increase slightly standard errors. To assess trends over time in the associations we analyzed the periods 1989–91 and 1995–97 separately. SAS version 8.2 (SAS Institute Inc.; Cary, NC) and S-Plus version 6.0 (Insightful Corporation; Seattle, WA) were used for the statistical analyses. Table 1 presents summary statistics describing the birth weight and gestational age distributions for the two race groups, while Figure 1 summarizes the associations between neonatal mortality and both birth weight (Figure 1a) and gestational age (Figure 1b). Variability in both gestational age and birth weight is higher in Blacks than in Whites; this is likely due to the higher preterm birth rate. The crossover is apparent for both measures, indicating that at lower birth weights or gestational ages, Blacks are at lower risk of neonatal mortality than are Whites, while at higher birth weights or gestational ages, Whites are at lower risk. 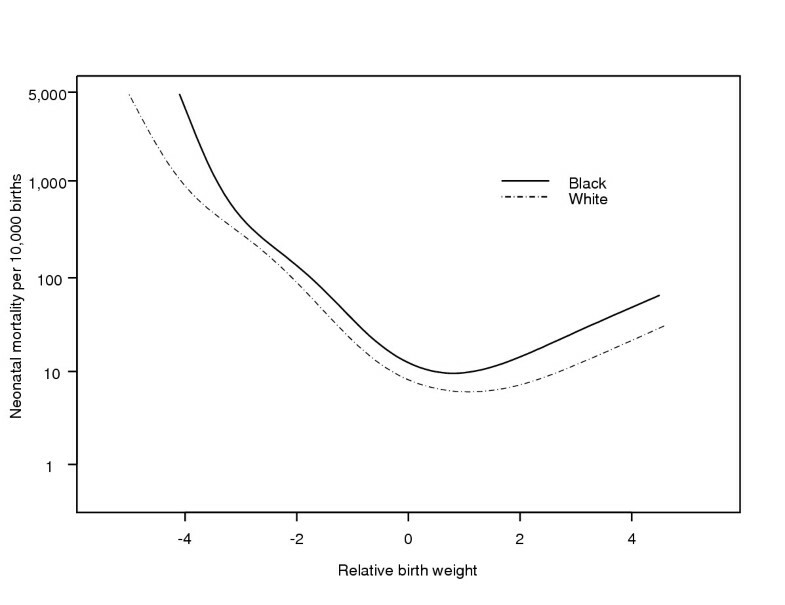 The crossover pattern (as assessed by the interaction between race and the smooth line) is statistically significant (p < 0.0001) for both birth weight and gestational age. Association between neonatal mortality and birth weight and gestational age. Figure 2 shows the association between neonatal mortality and relative birth weight. No crossover is observed for relative birth weight. Association between neonatal mortality and relative (z-score) birth weight. Figure 3 shows the association between neonatal mortality and birth weight (top row) and relative birth weight (bottom row), for several gestational ages. The pattern shown in Figures 1 and 2 remains; a crossover occurs for birth weight but not for relative birth weight. The rugplot along the X axis shows the density of birth weight data at these gestational ages. Association between neonatal mortality and birth weight (crude and relative), at fixed gestational ages. Figure 4 shows the race-specific mean birth weight for gestational age (Figure 4a) and mean gestational age for birth weight (Figure 4b), fitted using a smoothing spline with 7 degrees of freedom. 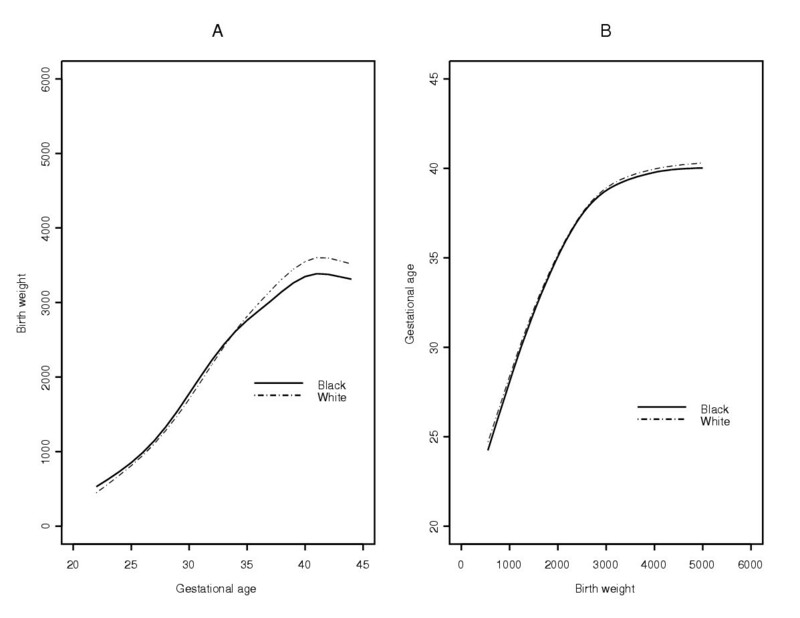 The mean birth weight for gestational age is higher in Whites than in Blacks, while the gestational age for birth weight curves are almost identical, with White infants having a slightly higher mean gestational age at any given birth weight. However, the difference in gestational age for birth weight is small and has little impact on mortality. 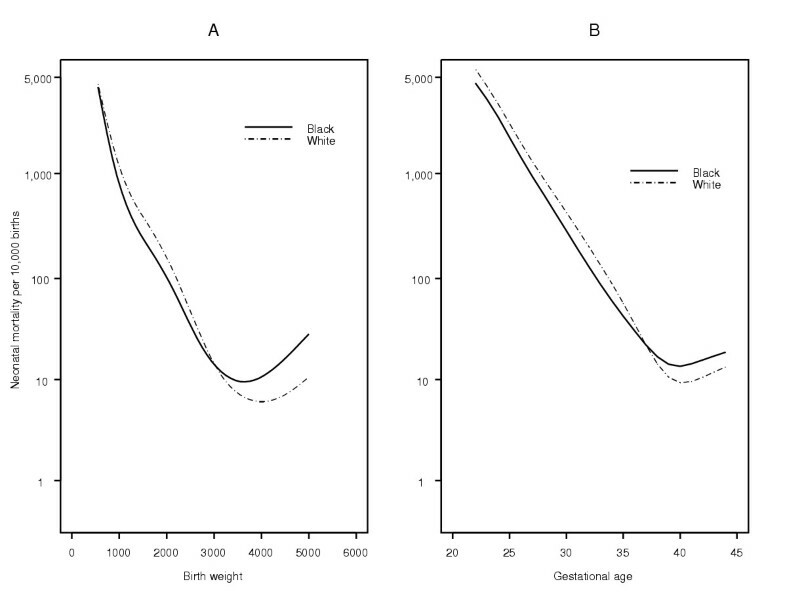 Association between mean birth weight and gestational age (a) and mean gestational age and birth weight (b). Figure 5 shows race-specific gestational age for relative birth weight. At relative birth weights below zero, the mean gestational age of Black newborns is at least 1 week lower than Whites of the same relative birth weight. At relative birth weights above zero, the mean gestational age is far more similar in the two groups, although it remains slightly higher in Whites. Association between mean gestational age weight and relative birth weight. We also considered the distribution of the difference between observed birth weight and optimal birth weight within categories of relative birth weight. Table 2 displays the mean difference between birth weight and the optimal birth weight, stratified by relative birth weight, for relative birth weights above 0. The mean absolute difference between relative birth weight and optimal birth weight above relative birth weight of 1.0 was 201 g in Whites vs 611 g in Blacks, suggesting that, in particular at high relative birth weights, birth weights among Blacks were more deviant from the optimal than those among Whites. When stratified into two time periods, results were similar in the early and late time period. Several findings emerge from this study. First, the crossover of neonatal mortality curves between Blacks and Whites is apparent for both gestational age- and birth weight-specific mortality. Second, as pointed out by Wilcox and Russell , the crossover does not occur for relative birth weight-specific mortality. However, although relative birth weight is intended to compare infants with like infants, the comparison may be severely biased at low birth weights (i.e., relative birth weights below zero). Gestational ages are considerably lower among Black infants with relative birth weights below zero than they are among White infants of similar relative birth weights. The association between birth weight and mortality, and that between relative birth weight and mortality, is similar at all gestational ages. However, the distribution of relative birth weight is very different at different gestational ages, and a large proportion of births with relative birth weights below 0 have preterm gestational ages. 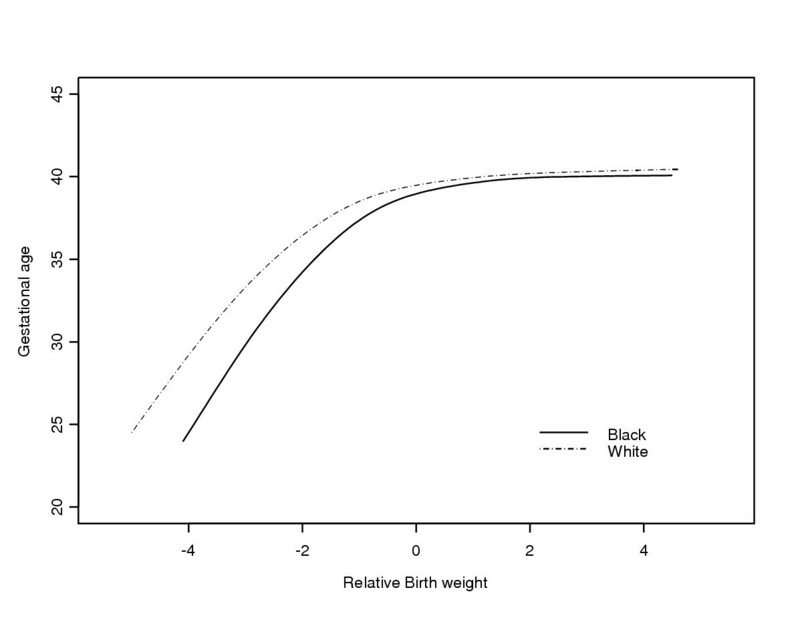 Use of relative birth weight in regression models may thus be problematic, as it could bias associations between race (or other predictors) and outcome. This does not invalidate the use of relative birth weight per se; however, it should be used with caution to adjust regression models. Above relative birth weights of zero, little difference was observed between Blacks and Whites in the mean gestational age for relative birth weight (Figure 5). However, as shown in Table 1 and noted by previous authors [16, 17], the optimal birth weight (the birth weight with the lowest birth weight-specific mortality) is above the mean birth weight (and hence above zero relative birth weight) for both race groups. Moreover, the difference between the optimal and the mean is considerably larger in the population (Whites) with a higher mean birth weight. As demonstrated in Table 3, relative birth weights above 1 are closer to the optimal weight in Whites than in Blacks. This proximity of observed birth weights to the optimal birth weight may well account for the observed survival difference between Whites and Blacks above relative birth weights of zero, although the reasons for this phenomenon are not readily apparent and remain to be explored. Also unexplored are the clinical implications of this result, and how optimal birth weights should be used in practice. Figure 3 provides evidence that the bias referred to in this article may be relatively minor. At 40 weeks gestation, the crossover is apparent for birth weight but not for relative birth weight, suggesting that at term (when most births occur), analysis by relative birth weight is appropriate. However, the bias suggested by Figure 2 occurs mainly at lower gestational ages (the rugplots in Figure 3 show that most births at early gestations have negative relative birth weights), where a large proportion of the neonatal deaths occur. This implies that the phenomenon is worth considering. An alternative hypothesis for the paradoxical crossover is that Black infants have a higher gestational age at a given birth weight [25, 26]. However, as Figure 4 shows, for a given birth weight, virtually no differences are apparent in mean gestational age between Blacks and Whites, and the small observed difference is in favor of Whites, not Blacks. The reason that Whites have both higher mean gestational age for birth weight and mean birth weight for gestational age is that the entire distribution is shifted towards both higher weight and gestational age. It is therefore possible that the lower mortality among small Black newborns is due to better survival at the same gestational age and birth weight, possibly due to more rapid maturation of critical organ systems [27–29]. A potential limitation of this work is the occurrence of errors in vital statistics records of gestational age . However, our results are based on data excluding the most likely erroneous observations , and any remaining erroneous observations in the data seem unlikely to be different across races, and thus unlikely to affect the overall pattern of our results. Excluding births with gestational ages above 41 weeks may have affected our analysis, as many valid births do occur at these ages. However, it is diffcult to distinguish between errors in gestational age and true values at these gestations . When gestational age is measured using LMP data, it is estimated that a substantial (>50%) proportion of births over 41 weeks are in error . Another limitation is the fact that optimal birth weight is estimated internally to the present dataset; should the true optimal birth weight be different it may affect these conclusions. The results presented in Figure 4 suggest that models which adjust for both birth weight (or fetal "growth") and gestational age will not account completely for crossovers in mortality between races. In spite of not accounting for this crossover, such models may nonetheless have substantial advantages over those based on relative birth weight. Models based on gestational age and birth weight together may more accurately separate the impacts on mortality of differences in maternal health from those due to access to, or quality of, obstetric and neonatal care. Also, and perhaps more important, such models separate out that portion of infant mortality due to a shorter length of gestation from that due to restricted or excessive fetal growth. Since much more is known about the etiologic determinants of fetal growth than of gestational duration [31, 32], such a separation should help reveal the extent to which recent improvements in fetal growth (primarily due to reduction in maternal smoking and improvement in maternal nutrition) [33, 34] have had an impact on infant mortality. Alternative approaches based on the "fetuses at risk" denominator  provide an alternative conceptual framework which may eliminate crossovers. Group differences in birth weight-specific mortality are complicated phenomena. These data present evidence that in the case of race, higher neonatal mortality rates in Blacks vs Whites at relative birth weights below 0 can be explained by differences in gestational age and that differences at relative birth weights above 0 may be associated with distance from the optimal birth weight. Thus, relative birth weights should be used with caution to make comparisons across populations. Other approaches which may be more biologically-based  may be better alternatives. All of these approaches, however, should be interpreted with consideration of the fact that the biological mechanisms that lead to the crossover are not well understood and may be meaningful. These results may help to guide future work in this area. While it is clear that much is still unknown about the associations between birth weight, gestational age, and mortality and how these associations differ across groups, it is important to be sure that comparisons between groups are appropriate. This work was funded by Canadian Institutes of Health Research (formerly Medical Research Council of Canada) grant MA-14707. Robert Platt and Michael Kramer are career scientists of the Canadian Institutes of Health Research. Cande Ananth was supported, in part, through a grant (ROI-HD038902) from the National Institutes of Health, USA. The authors thank KS Joseph for helpful discussions. RP conceived of the study, participated in design of the study, carried out all analyses, and drafted the manuscript. CA participated in design of the study, constructed the relevant datasets, and reviewed the manuscript. MK participated in conception and design of the study and reviewed the manuscript. All authors read and approved the final manuscript.